Persistence Market Research tables a comprehensive, state-of-the-art analysis of the global dysphagia management market in a new publication named, “Dysphagia Management Market: Global Industry Analysis and Forecast 2016-2024.” As the name suggests, we have forecasted the global dysphagia management market across different geographical regions and on the basis of the various market segments and have provided a critical assessment of the opportunities available to all the companies operating in the global dysphagia management market. Our analysts have studied the market extensively and have identified multiple drivers, restraints, and trends that are expected to influence the global dysphagia management market and consequently the business operations of the leading as well as second-in-line players functioning in the global dysphagia management market. Through extensive research, our analysts have studied how the different market dynamics are likely to impact the current environment and future scenario of the global dysphagia management market, thereby providing useful insights to market players to plan their differentiating strategies capable of evolving with the changing market landscape. The report unwraps the future of the global dysphagia management market and begins with an overview of the market followed by key definitions and an executive summary that gives a 360o view of the revenue forecast of the global dysphagia management market. In the market taxonomy section we talk about the different segments of the global dysphagia management market. In the next section, we analyze the key market dynamics and present our independent analysis of the various factors, challenges, and market trends that we feel will define the market in the next few years. In the market forecast chapter, we predict the market volume and market worth. We have devoted the last section of the report to study the market performance of some of the top companies operating in the global dysphagia management market. Persistence Market Research has leveraged extensive secondary and primary research to reach the final conclusion about the global dysphagia management market. We have identified the top industry players, major regional markets, manufacturers, distributors and predicted the fate of the market though our tailor-made research process. We have scrutinized the accumulated data by using advanced tools to obtain a clear insight of the global dysphagia management market. In this report on the global dysphagia management market, we have encapsulated the key metrics that accurately describe the global dysphagia management market and used this data to compare market performance across the various segments and regions. Apart from estimating the Compound Annual Growth Rate (CAGR) for the global and regional markets, we have also analyzed the global dysphagia management market on the basis of growth parameters such as Year-on-Year (Y-o-Y) growth to understand market predictability and to identify the right opportunities likely to emerge in the global dysphagia management market. We have studied different market segments by conducting a Basis Point Share (BPS) analysis to understand the relative contribution of individual segments to overall market growth. Another notable feature of our report is an analysis of the revenue forecast of the global dysphagia management market in terms of absolute dollar opportunity. While this is usually overlooked when forecasting the market, we believe absolute dollar opportunity analysis is critical in assessing the level of opportunity that market providers can look to achieve and also to identify potential resources in the global dysphagia management market. Persistence Market Research has also developed a market attractiveness index to help top market players identify current and future market opportunities. The global dysphagia management market is anticipated to register a CAGR of 6.2% by the end of the forecast period and is likely to be worth more than US$ 3,140 Mn by the end of 2020. Revenue from the global dysphagia management market is estimated to cross US$ 4000 Mn by the end of 2024. The North America Dysphagia Management Market accounted for the largest revenue share of more than 35% in 2015. Increasing geriatric population and growing incidences of oral cancer in the U.S. represents a key growth opportunity for manufacturers of dysphagia management products. The Asia Pacific Dysphagia Management market is projected to register a CAGR of 6.9% over the forecast period due to rising awareness and growing incidences of strokes accompanied with dysphagia. Within the foreseen period North America and Europe will compete hard for a larger market share, though the North America region is anticipated to dominate the global dysphagia management market. The North America region is expected to hold more than 34% of the global dysphagia management market. The North America dysphagia management market is likely to cross US$ 1450.2 Mn by the end of the forecast period. The Europe dysphagia management market will expand at a CAGR of 6.4% within the period of prediction. The APAC dysphagia management market will battle hard to maintain the third position in the forthcoming years. China, Australia and Japan are expected to play a crucial role in the growth of this regional market. North America dominated the Global Dysphagia Management Market in revenue terms in 2016 and is projected to continue to do so throughout the evaluation period. The region will emerge as the most attractive market within the forecast period. The U.S and Canada will play a pivotal role in the overall development of the dysphagia management market of this region. The value of the U.S market was more than US$ 900 Mn in 2015 and it is likely to be a little less than US$ 1500 Mn by the end of the period of assessment. Canada Dysphagia Management Market is expected to grow at a steady CAGR of 5.7% over the forecast period due to rising awareness among the population. 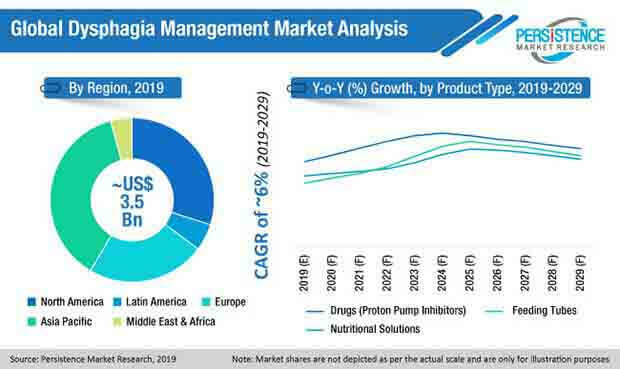 By Product Type, the nutritional solutions segment dominated the North America Dysphagia Management Market in terms of revenue in 2015 and is projected to continue to do so throughout the forecast period. The nutritional solutions segment is expected to be the most lucrative segment in the North America dysphagia management market. By Indication, the oropharangeal dysphagia segment is expected to be the most lucrative. By Distribution Channel, hospital pharmacies and retail pharmacies companies are expected to emerge as the most lucrative segments of the North America dysphagia management market. The key shareholders in the market are mulling over new mergers and acquisitions. U.S based Eisai Co. Ltd. reported more than 6% growth in revenue in 2015 and is likely to focus more on the North America market to maintain its global dominance. In the last few years C. R. Bard, Inc. has acquired several companies such as Medicon, Inc., Medafor, Inc., Neomend, Inc., Lutonix, Inc., Medivance, Inc. etc., which has resulted in increased profitability. AstraZeneca plc is carrying out a wide range of co-promotional activities to invade potential markets through distribution agreements with players having a strong regional presence. The company is subject to generic competition from Pfizer in Europe.